Renowned for their dependability and high residual values, the NT400 Tipper provides a cost-effective proposition in terms of initial outlay and fuel efficiency delivered by the Euro 6 engines. Available with one-way or three-way electro-hydraulic tipping, the NT400 Tipper comes with in-car Tipper operation. It offers a loading capacity up to six Euro pallets with both aluminium and steel bed options. The 3mm steel reinforced bulkhead exceeds all international standards for cab protection, especially from unrestrained loads. It has robust wheel arch and side protection to keep the vehicle chassis in top condition. The NT400 Tipper features a reliable and safe multistage tipping cylinder that is capable of supporting up to 3,000kg load capacity. Keep precise control of any tipping operation using the easy access remote control. THE NT400 TIPPER IS AVAILABLE FROM ONLY £360 PER MONTH. 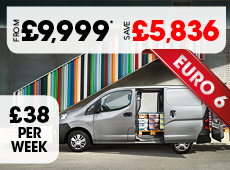 THAT IS JUST £83 PER WEEK!